When I set my 19 goals for 2019, I chose a few home improvement related goals. One of them was to have our front door repainted, as it was on my to do list for most of 2018 but never happened for one reason or another. Another is to make B’s room into a proper little nursery, and a third is to ‘make our house a home’. I also toyed with the idea of adding a makeover for our ensuite bathroom. I hesitated on this one, though, as at the time of writing I was reluctant to commit to spending a chunk of money on a room that doesn’t really have anything ‘wrong’ with it. So I decided to refrain from making it a goal in itself, and instead have mentally lumped it in with my goal to make our house, a home. Since we bought our house five years ago, the ensuite has always been my least favourite room. Our house is only ten years old, and unfortunately, it would appear that the walls are made out of paper! The previous owners installed various towel rails and shelves, all of which are too heavy for the walls and have ended up hanging off them. Even the toilet roll holder is broken! I yanked the towel rail off the wall pretty soon after we moved in, but made a bit of a hash of filling the holes, and haven’t bothered to sort it out, as I’ve always told myself that there’s no point, as one day we’ll sort the whole room out properly. I really want a new shower cubicle, as the one in there currently is pretty cheap and ropey-looking; the outside covers for the shower tray keep falling off. In an attempt to spruce the room up a bit, and hide from the shame of my limescale-ridden shower head now that we have a cleaner, I bought a new shower head in the latter part of last year. It’s made a huge difference to the quality of the shower, but I still think we need a new cubicle. So, that’s item one on the wish list! I thought the room couldn’t really get much worse than it was, but it turns out that I was wrong. A couple of months ago, out extractor fan stopped working, and now we have mould making its way across the ceiling. I don’t really know where to start on sorting this one, as we don’t know an electrician and I don’t know the first thing about buying and installing extractor fans. So up to now, I’ve just let it go. The shame of writing that last paragraph made me pause to Google extractor fans, and it turns out that you can buy a new extractor fan for about £30, but need a qualified electrician to fit it. So I’ll make that item two on my wish list. Followed by item three: Find out how to remove mould from the ceiling, and repaint. The final thing that I hate about our ensuite is the flooring. We currently have the original piece of linoleum in there, which I very much hope wasn’t fitted by a professional, as it hasn’t even been cut to fit the floor properly. 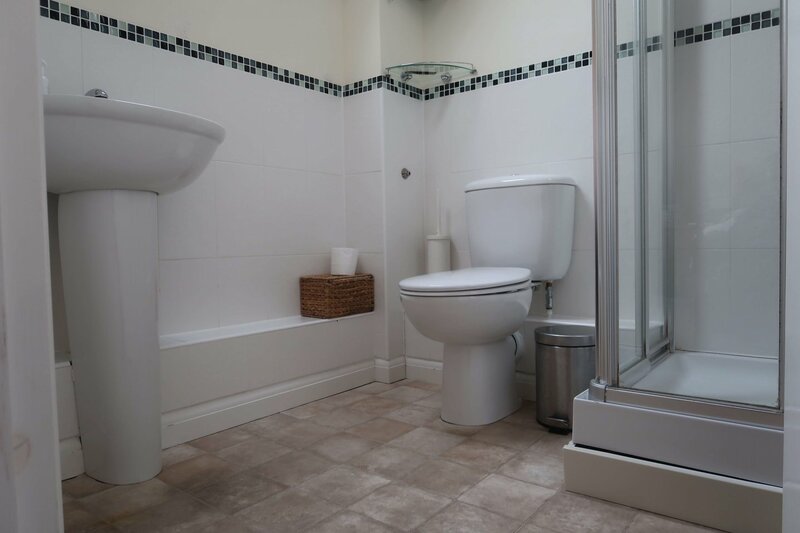 I really like the look of laminate flooring, but I’ve heard that it’s not a good idea to use laminate in bathrooms due to the risk of water damage, so I think I’ll choose vinyl or LVT (Luxury Vinyl Tile) instead. Flooring is a definite must on the wish list! Finally, I need to take down the current shelves, make good and repaint the walls and put up some new storage solutions. I’m not sure the budget will stretch to new tiles, but it would be amazing if we could make over the whole room completely. 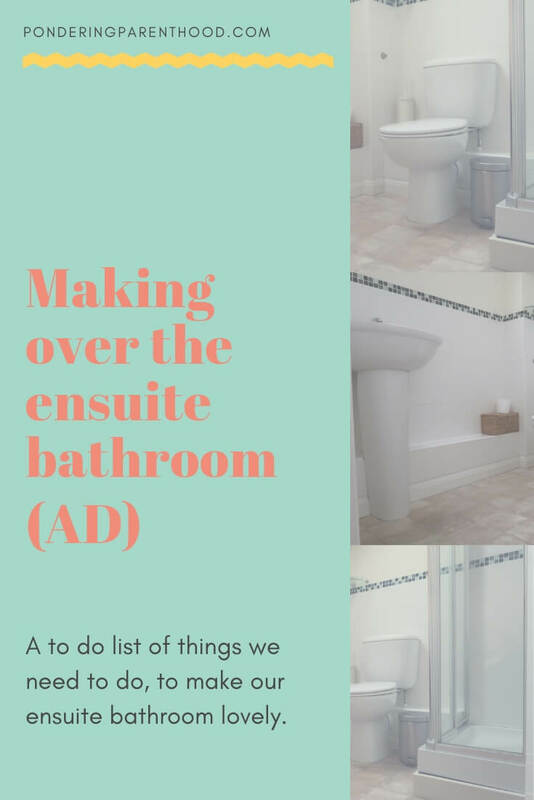 I think my biggest concern with the ensuite is not having the know-how to sort it out myself. I’m great with flatpack furniture, and have managed to put up hooks and picture frames around the house. Plumbing and electrics, though, are a whole different ball game and I’m simply not qualified to do it myself. Time to call in some experts!